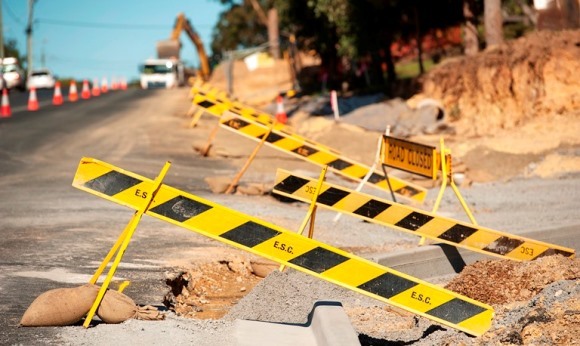 Work is continuing on a major upgrade to Beach Road, Batemans Bay, between the Princes Highway and Orient Street. Photo: ESC. A major upgrade of Beach Road at Batemans Bay is underway better linking the Princes Highway and Orient Street. Works began this week to modify the car park at the Batemans Bay Visitors Centre. Step one will see a widening of Beach Road to provide an extra left-turn lane onto the Highway. The car park is being reconfigured with the existing direct access to Beach Road removed. Part of the visitor centre car park will be closed while Eurobodalla Shire Council gets the job done. Access to the car park will be retained via the Beach Road/Perry Street roundabout and Hill Street. Works have also started near the Beach Road/Orient Street intersection to accommodate construction of a dedicated right-turn lane for vehicles turning south into Orient Street from Beach Road. Council hopes the additional right-turn lane will reduce traffic congestion at the busy intersection as well as improve road and pedestrian safety. Beach Road will be widened on both the courthouse side of the road and in front of the NAB Bank to make way for the extra lane. A number of fig and gum trees on the northern side of Beach Road will be casualties of the work. The existing car park on the south-western corner of Beach Road and Orient Street, outside the NAB Bank, will be removed and replaced with a new paved forecourt with the aim of improving the amenity of the area. Progress is subject to the relocation of power lines and underground services. Council says, later works will include lengthening the two lanes in Perry Street that approach the Beach Road/Perry Street roundabout, the installation of new medians and pedestrian refuges and provision of two lanes exiting Mackay Park onto the Princes Highway. The $3 million project is funded by the Australian Government’s Building our Future program and is geared towards the future redevelopment of the Mackay Park precinct, which includes plans for an indoor aquatic and cultural centre. Council’s timeline for the staged project points to completion in June 2019.